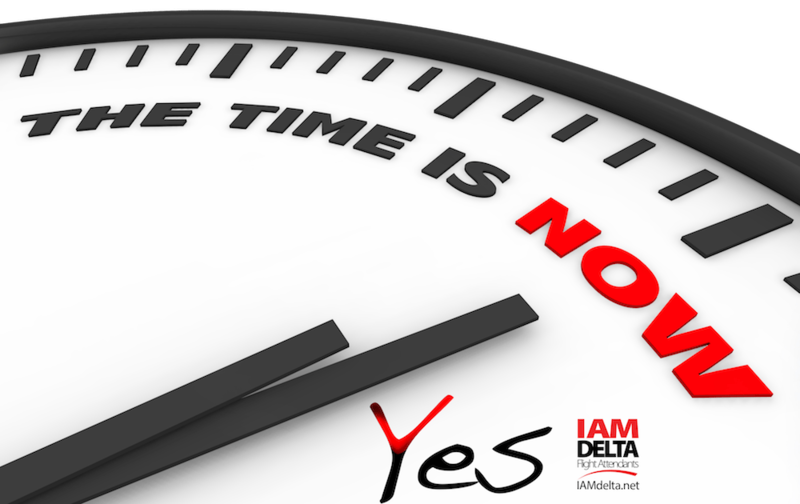 Since the turn of the new year, our IAM-Delta campaign has hit a new gear. Tens of thousands of individualized, sequenced election authorization cards (A-cards) have been mailed to Delta Flight Attendants, emphasizing the importance of signing, dating, verifying and returning our a-cards now. Signed A-cards have been flowing into IAM Headquarters and we are nearing our goal of being able to request an election for union representation. However, we are not there yet and that's why it's of the utmost importance to get our A-cards submitted today. We will be able to file for our election as soon as early April. To be successful, we need all Delta Flight Attendants who seek a real Voice in our shared future to submit their A-cards today and encourage our co-workers to do the same. Call your friends. Talk to your Flight Attendant co-workers face to face and tell them the benefits of forming a union. To realize our goal, Delta Flight Attendants are phone-banking and making house calls in targeted locations around the country. These Flight Attendant activist volunteers realize the urgency of our campaign and are doing everything in their power to get us to an election. We need you to have that same urgency and send in your A-card today. Remember, it is our legal right under federal law to freely form a union. And for those of us that are fearful that Delta will discover who signed an A-card, don't be afraid. Delta is prohibited under federal law from ever finding out who signed an A-card or how we vote in a union representation election. Delta management will continue do everything in its power to prevent Delta Flight Attendants from attaining a vote for union representation. We all must ask ourselves why Delta management would do anything and everything to prevent a vote. The answer is that at present Delta management can change any of our terms of employment at any time for any reason and that is very valuable. The massive cut in our profit sharing pool, staffing reductions on certain aircraft, the ability to pass along health insurance and prescription drug costs are just a few examples. Our shared future as Delta Flight Attendants should not be decided solely by Delta management. We deserve a say in the decisions that affect our professions and lives. That is why we need to send in our A-cards today.